Sony’s new PRS-T3 looks very similar to its predecessor, the PRS-T2. They are both six inch devices and have the same buttons along the bottom of the device – 2 Page Turn buttons (backwards and forwards), Home, Back and Menu. There are some subtle differences however. The T3 is shorter and lighter and also has a thinner bezel. The back of the T2 was flat whereas the back of the T3 looks as if the backplate has been left off. That’s until you realize this has been done intentionally. Firstly it allows you access to the Micro SD slot and secondly it allows you to fit in place the cover that comes with the eReader. It just slots nicely into place to give the eReader a proper back and a nice sleep case for the front. The case is thin and fits nicely onto the eReader and when closed it puts the eReader into sleep mode and wakes up the device when you open the case. The T3 also comes with a USB slot, power button (which illuminates red when charging and goes out when fully charged), hard reset button and sleep button. The T3 comes with the same 1 GZ processor and 512 MB of RAM that the T2 had and it has the same 2 GB memory (1.2 GB available for storage) which is expandable to 32 GB via a Micro SD slot on the back. The display this time around features a newer HD Pearl screen which has a 1024 x 758 resolution compared to the T2’s 800 x 600 resolution. Comparing them both side by side the T3 is a lot sharper. It is the same screen as used on the Nook Glowlight and Kobo Aura so compares well in terms of contrast and crispness of text. It isn’t as flat to the bezel as the Kobo however. Comparing it to the Kindle Paperwhite 2, I found while both screens feature the same resolution and the text is equally crisp, the Kindle’s newer Carta technology produces a slightly whiter background. The biggest omission on the T3 is the lack of a built-in front-light. Where all the major eReader companies have gone down this route, Sony has been very reluctant to. I can understand leaving off a front-light is you wanted to produce a cheaper budget model, the the price of the T3 is clearly not a budget price. It does tend to put off people who want to read in bed with the light off or who find themselves in a not very well lit area. Sony does off a cover with a built-in light, but this costs another $60 and I found it to be less than ideal for reading and no where near as good as the built-in front-lights that most eReaders use. 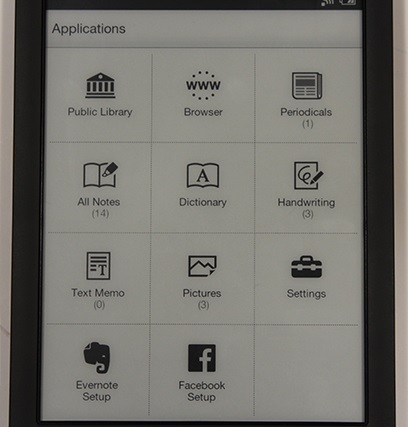 The T3 features almost the exact firmware as the T2 with the only difference being the addition of 2 new dictionaries and on the Home Screen a button in the top right corner to toggle between your last open book and your recently recently read books. 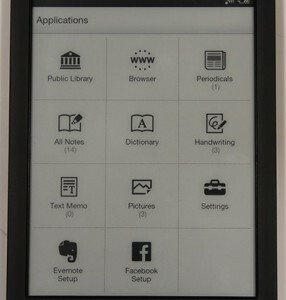 The T3 allows you to interact with Facebook and Evernote. Once you have logged into your Facebook or Evernote account through the applications menu, you can sent updates, or highlight parts of a book and sent it to Facebook or Evernote. The interface on the Sony clear and intuitive. The Home screen shows your latest download, below that you have the last book you read and you can just click continue to carry on reading where you left off, recently added books, access to your entire book collective and entire periodical collection, the Sony reader store and finally Collections which is where you can organize your books under various collections. Clicking on the right arrow in the bottom right hand corner brings you to page 2 which has the following options: Network which has Public Library, Google Books, Browser and Purchase Content; Reference which has Notes, Dictionary, Handwriting and Text Memo; Multimedia that has Pictures and Audio and Lastly, System which has all the Settings. It is running Android and it is laid out very nicely and logically. The PDF viewer allows you to use landscape or portrait modes. You can also use landscape mode for books, magazines, periodicals, textbooks etc. It does allow you to setup proper reflow options though for complex PDF documents. You can change font size and scale using pinch and zoom, but you have to do this every time you turn a page. It still works pretty well, not as good as the Nook Color. A good feature when using PDFs is the ability of using your finger to move around large PDFs that don’t fit on the whole screen. There is also a map in the bottom right corner so you know where you are in the PDF (similar to that found on Kobo eReaders). The memory is the same as with the T2 at 2 GB (1.2 GB of which is available for content), but as before you can add addition memory (32 GB max) via the micro SD slot. Sony has officially said that they won’t be selling the PRS-T3 in North America. A search on Sony USA, Target, Buy.com and other retails proved fruitless. The only place I could find it was on Amazon and the cheapest price on there was $149.98. On the plus side the new T3 has an improved display which offers nice crisp text and decent graphics. It has a good selection of features, handles PDFs well and their Reader Store is well laid out with a good selection of eBook, magazines, comics and newspapers. That all being said I can’t help thinking that Sony have a missed a trick here with the T3. While most of their rivals have gone with a built-in front light, Sony haven’t. It is also priced higher than the Kindle paperwhite 2 (both the ad and ad-free editions), the Kobo Glo and Aura as well as the Nook Glowlight. All in all a decent eReader and an improvement over the PRS-T2, but there are better, cheaper eReaders available WITH build-in front lights.